A combination of flatwater, intimate creek within a city park and Mississippi River paddling amongst barges and big bluffs, Catfish Creek is an interesting adventure. Time: Put in at 1:45p. Out at 3:10p. Wildlife: A ton of great blue herons, many bald eagles and lots of hawks. For several years now I have maintained a tradition of spending my birthday at the Mississippi River, though this was the first I’d ever been in my boat for the occasion. After several days of wonderful paddling on the Yellow River but before driving home to Madison, I thought I’d tack on this short little jaunt like a feather on a felt hat. It was delightful, although somewhat nerve-racking since the current was very strong and occasionally strange. Catfish Creek is a delightful paddle in its own right, with lush surroundings of pine-topped bluffs and wildlife. The last couple miles of it are enclosed in the really quite awesome Mines of Spain State Recreation Area. It’s like having an incredible and gigantic state park right in the middle of a city. I cannot rave enough about this park and am genuinely envious of those who live near it enough to frequent it regularly! The boat launch has great water access and plenty of room for parking (no facilities though). I had wanted to put in further upstream but it was not meant to be (see below). Thus, putting in at the boat launch is a paddle up-and-back experience, which is fine since there’s virtually no current. In fact, it was easier to paddle upstream than downstream since the Mississippi River was so high and it was backfilling the creek. 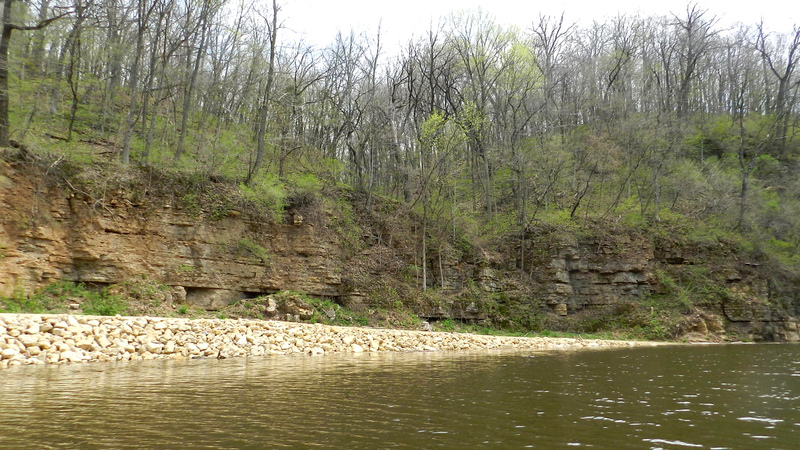 There are gorgeous cliffs and caves as you paddle closer to the mouth at the Mississippi River. As for the mighty Mississipp, it’s a unique experience, especially at flood stage. Obviously, if you don’t like big, wide rivers, then this is not for you. But if you’re cool with that and don’t mind the wake from barges or dodging driftwood debris (like whole trees and giant logs), then I definitely recommend this trip, especially since it’s only four miles or so on the big river itself, with great accesses and public land with pretty rock outcrops. That and you practically zoom on the big river, especially when it’s high (consider: this trip took less than 90 mins to paddle almost 7 miles, two of which were up and down a creek with no current, plus an excursion through and short rest at a flooded island). Once you leave the creek and are into the river, carefully turn your boat upstream and A) look up at the bluff and you’ll see the castle tower parapet, the Julien Dubuque monument and B) beyond that, upstream, is downtown Dubuque itself (incidentally, there’s a great hiking trail up to the monument from the parking lot of the boat launch that’s worth checking out, too). Turning back around and facing downstream, you’ll soon see a huge bluff on the right called Horseshoe Bluff that looks like it rises right out of the river. This stretch of the Mississippi is a combination of the National Wildlife Refuge and lots of humanmade stuff like freighters and commercial vessels. It makes for an interesting mix though, the wildlife juxtaposed with Maersk containers and John Deere equipment especially. One of those islands, just east from the Massey take-out, is called Ninemile Island, which I paddled up and into since the river was high, so why not? In normal times (see satellite image) there are back channels and sloughs galore in this big glob of land in the middle of the river, accessible only from the upstream/south end that you then have to paddle up. Most of this was flooded over but I did find one slough, which I found exhilarating. Here, tucked away on a slough on an island on a river, I just sat in my kayak, letting the rays of 70+ degrees warmth sunlight filter through the budding leaves and soak into my skin. The sound of birdsong full and flush, the sight of all that water from northern Wisconsin and Minnesota floating past fast. I spooked a great blue heron away but not a family of turtles sponging up the sun on a log. I knew I didn’t have a long time to hang out in this nook but savoring this final moment before heading home was just delightful. The contrast between tough-muscle Mississippi River and this motionless moment hidden in plain sight, a small world anchored and driftless in its own right, quiet and tranquil, it was perfect. Lastly, because the take-out itself was flooded, I was able to paddle across the lawn, over benches and fire grates, within two feet of my car in the parking lot, a nice novelty indeed! Postscript: So why’s it called Mines of Spain… in Iowa? Well, before France sold a whole hell of a lot of land to the United States a la the Louisiana Purchase, it had given this land to Spain, an ally, back in 1762. In 1796 the Governor of Spain leased some land to none other than Julien Dubuque, the first European settler in Iowa. Lead was discovered in this part of the country, in nearby Galena, Illinois and southwestern Wisconsin. Mines were built on the bluff where the Catfish Creek entered the Mississippi River, an area where the indigenous Mesquakie peoples had lived for thousands of years and established a trading post with the French voyageurs. Hence the Mines of Spain. Incidentally, the state flag of Iowa is based on the tricolors of the French flag, as it was part of the land sold in the Louisiana Purchase (by which time France had taken the land back from Spain so that Napoleon could pay for his wars). Iowa’s state flag is the only one in America based on the French flag. As to why the city of Dubuque is named Dubuque and not Julien, I have no idea! There isn’t anything about this trip I didn’t like. However, I will say that my original idea of putting in upstream on Catfish Creek and paddling only in one direction (downstream) to the Mississippi was kyboshed by private property/no trespassing signs at multiple would be put-in spots that I had considered via satellite map. Perhaps others have had similar ideas and that’s why landowners posted signs. I gave up looking and simply resigned myself to a there-and-back jaunt on Catfish Creek via the Mines of Spain boat launch, even though I prefer to paddle one-way only. I should also mention that there were a couple of standing waves I had to engage while on the Mississippi River. I didn’t mind this per se but I wasn’t anticipating having to pay strict attention the whole time – a leisurely lazy paddle on the big river this was not. With so much water and so many things on and in it, odd eddies and strange currents came from all directions. Again, I did not dislike this but I feel obliged to mention it for those considering some paddle time on the Mississippi River. How much of that was due to the high water vs. the big river’s natural, ordinary state, I have no idea. I would definitely do this trip again but differently. First, I’d go after the level has gone down and it’s a bit tamer! It would be nice to spend time paddling around/inside the islands and back channels of the Mississippi River – those places where many would argue the true soul of the river lies. And, if possible, I’d like to put in somewhere upstream on Catfish Creek or, failing that, Granger Creek, which feeds into Catfish Creek a mile upstream of the Mines of Spain boat launch. A cute sign, but the creek isn’t that paddler friendly. Boat launch put-in at Mines of Spain Recreation area. Don’t know how legit this risk is, but you’d hate to find out the hard way! Cool rock outcrops along Catfish Creek. Sunning it up on the creek. Even cooler rock outcrops near confluence with Mississippi River. Railroad bridge before entering the river. Looking up at the Julien Dubuque monument above the bluff. Whole lotta tree debris flushing downstream. As you paddle alongside, be careful of the waves bouncing off the walls. Combination of nature refuge and human commerce. Finally! Where semaphore and semiotics mix. That’s a whole tree floating downstream (best to avoid). Adorable family of turtles on a slough log on Ninemile Island. The tranquil slough on Ninemile Island. In the back channels of the Mississippi River. Underwater bench at marina due to flood. Paddling right up to my car in the flooded park. Flooded park at the marina take-out.